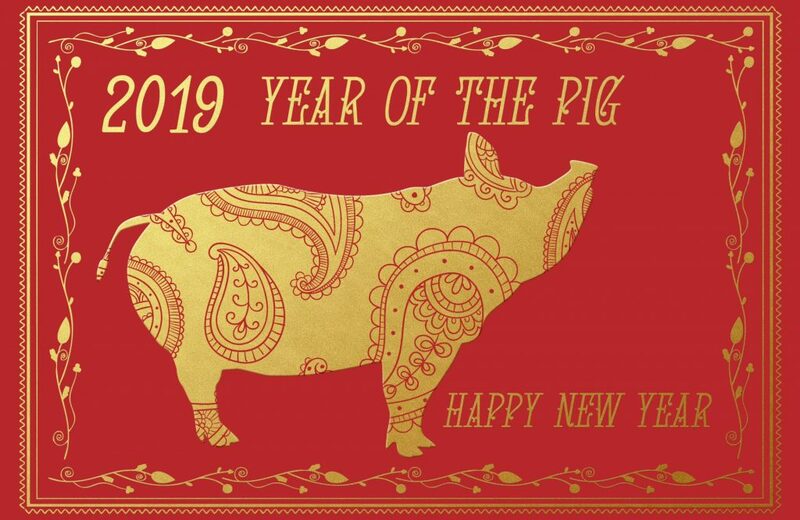 We at Villa Tempest would like to wish you, one and all, a very prosperous Year of The Pig. To You and Yours, from Us and Ours, we wish you all the very best for the coming Year, 2019. We hope that your goals and dreams, this year, amount to being everything you hope for. Over the coming months we hope to resolve grittiness issues, with our stone flour mills; to successfully make, “On Demand” fresh ground pastry flour from whole wheat berries; to improve our bread and pie baking processes; and to offer something tasty, and new to interested expats in our local region. All the best from Villa Tempest! In the last few years we seem to run foul of attempts to Stop Fake News, Control Anonymous Postings, and other such socially-encouraged, vigilante justice like Scroll-by (drive by) Social Network Assassination. My Facebook Profile has been down since February 2016, LinkedIn, and Xing, in quick succession shortly after that, and more recently my Twitter accounts – Funny, my clearly pseudonymous Twitter feed was/is quite ok? Go figure. To make matters worse, we missed a Bluehost Renewal Deadline by a week and somehow their system deleted Our site, completely. Thankfully the Wayback Machine had us covered and we were able to recover most of our former postings and image library. We have now moved over to Internet Solutions HK, for domain registration and hosting, and hope things will be soon put right again. It’s been so frustrating, trying to recover our entire site, and even the WordPress backups that we had made via Bluehost turn out to be incompatible with the new hosting regime – something to do with .tar files are not .xmr files, or something like that. Grrrrr…! So, do please bear with us, we will be up and running again soon. But, for now, I’d like to give a shout out to all of those food bloggers who took the time, in the past, to check out our info, test it and give a thumbs up in appreciation, especially the folks at ALE.is.GooD – it feels great to know that we are being read from time to time. I wrote a little booklet back in 2012 about this wonderful Chinese dish. Today, I just updated it, making a few corrections and changing the recipe a little to reflect an improved understanding of the process of making this dish. Couple of things to add though, if you have access to Louisiana Crawfish, then feel free to use that instead of the Chinese variety. If you don’t have access to either then one option is to use IKEA Kräftor, which on last check are sourced from China and are of the correct crayfish species. Another alternative is to use some other medium to large, fresh water crayfish, e.g. if you’re in Australia yabbies are a good substitute. If using Kräftor, they need to be rinsed and soaked to reduce the influence of the dill that they are packed with. Oh and one last thing, when adding water to hot oil, be really careful! The oil has to have had a chance to really cool down so that the temperature is around 100°C or a little lower. This is really important! Gemüserolle auf vegetarische Art – Vegetarian-style mixed vegetable roll. In recent times I’ve had pretty good success with my “Piebase” [a shortcrust style pastry typically used in Australian-style handheld savoury pies) so much so that making it is no longer a chore – I enjoy the process and the results. Now, I’m experimenting with grinding my own flour. This means my piebase is morphing into a wholemeal pastry, but at present I’m still wrestling with grit that is noticeable to the tooth. If I can get this sorted, I’ll be very happy. 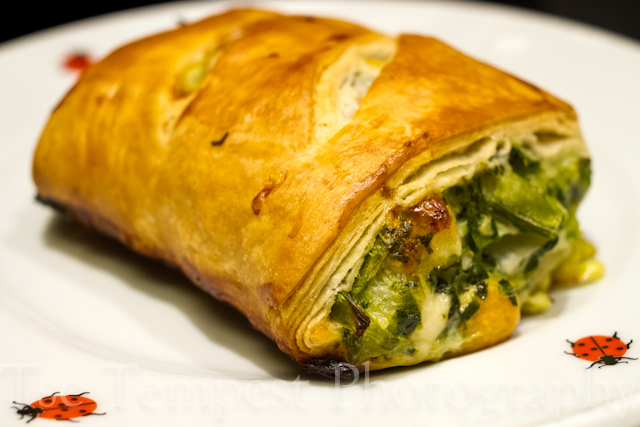 Meanwhile, I was thinking about my pietops and sausage roll pastry – a puff or rough puf pastry. Now, it was mentioned to me, by a great bvaker in Tasmania, that I could take ordinary piebase and use it as the détrompé for making rough puff pastry, but like usual I forgot that little detail in the mass of many things happening at the time. However, today I was researching vegetarian dishes, in particular Indian and Turkish as some of the vegetarians in my German language class are vegetarian, Indian or Turkish. 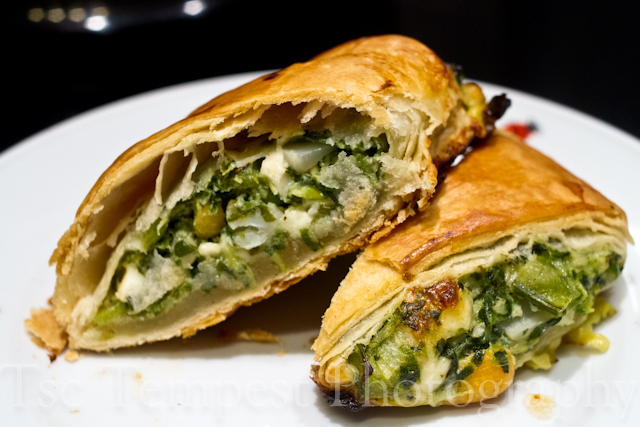 I came across a great website that had a listing for Puff Borek, a Turkish style vegetarian sausage roll, so to speak and reading through the recipe details reminded me of what I’d been earlier told, so… having some leftover piebase in the fridge, I pilled it out and followed the details for Puff Borek Pastry. Two turns later, some chilling and filling with an ad hoc vegetarian filling, and here’s how the pastry looked, out of the oven. The layered structure is clearly visible. Looking good so far, but what about the crispness, lightness, flakiness? Cutting it open and I couldn’t be more happy. Basically, what I did was pass the piebase through my dough sheeter until it was about 1 mm thick. I then took melted margarine and laid down a coating on a section of pastry, folded the pastry over itself and repeated the process. This produced three layers of dough with two layers of fat in between. I then butter half od the top of the dough and folded it over itself again. The edges were sealed and the pastry wrapped and placed into the fridge. Turn One Complete (6 layers of dough, 5 of fat). I repeated this process a second time (36 layers … ) and after chilling, rolled the pastry out to 3mm thick, filled it and then baked low in the oven at 250C for 25min. “Very Happy” with the results. Not hard to do, takes a bit of time, but in the intervals I was able to make the filling, drink tea and do other things. No Problem. This is very easy pastry making at its best. Love it! Category Chinese Cooking | Tags: | Comments Off on Gemüserolle auf vegetarische Art – Vegetarian-style mixed vegetable roll. Hi folks, just a quick update. What do you do when you’re not doing anything? I’ve been chasing the holy grail of Hunan Cuisine for some time now, and I think I’ve finally got it after a 12 year odyssey. Chángshā Kǒuwèixiā (长沙口味虾) is a spicy, fiery street food dish of, cooked on the spot, freshwater crayfish which is fantastic with beer on a sultry summer evening spent with friends. The booklet is freely available for download, no questions asked, not signups, not trackbacks, etc. Feel free to grab yourself a copy, try it out and let me know, over on our Facebook Page, what you think. Recently, we’ve been reviewing our time in China and some of the many, many dishes we enjoyed. By doing this we’ve managed to nail down a set of dishes we believe encompasses our experiences and would make the Number One’s list. This of course begs the question, what dishes would make it onto your, all time favourites, Chinese Banquet Menu? …And that’s the latest news from Villa Tempest.